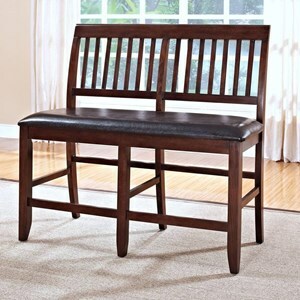 Add simple seating around your dining table with this bench. 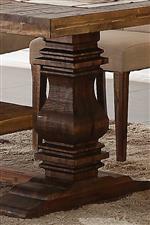 The solid wood top is supported by a double pedestal base that features carved detailing. The distressed finish of the wood offers rustic appeal. The Normandy Dining Bench with Double Pedestal Base by New Classic at Beck's Furniture in the Sacramento, Rancho Cordova, Roseville, California area. Product availability may vary. Contact us for the most current availability on this product. 304612320 Bench Top 1 79" 16" 18"
Bring a rustic feel into your dining room with the addition of the Normandy dining collection. A heavily distressed finish on the table top offers a vintage look to the table which rests on thick, carved double pedestals. 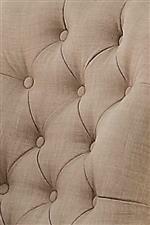 Ample seating space is provided by the upholstered chairs and dining bench of this collection. Store your best dinnerware in either the china cabinet or sideboard that each provide felt-lined drawers to keep delicate items in pristine condition. Have a nice home cooked meal with the family and enjoy the Vintage Distressed of Normandy. The Normandy collection is a great option if you are looking for furniture in the Sacramento, Rancho Cordova, Roseville, California area. Browse other items in the Normandy collection from Beck's Furniture in the Sacramento, Rancho Cordova, Roseville, California area.